Now we have a super-organised craft box, what do we do with it? Get crafting, of course! We needed a really simple activity combining glue and 'shiny'. And in keeping with the festive spirit of Diwali, the festival of lights. 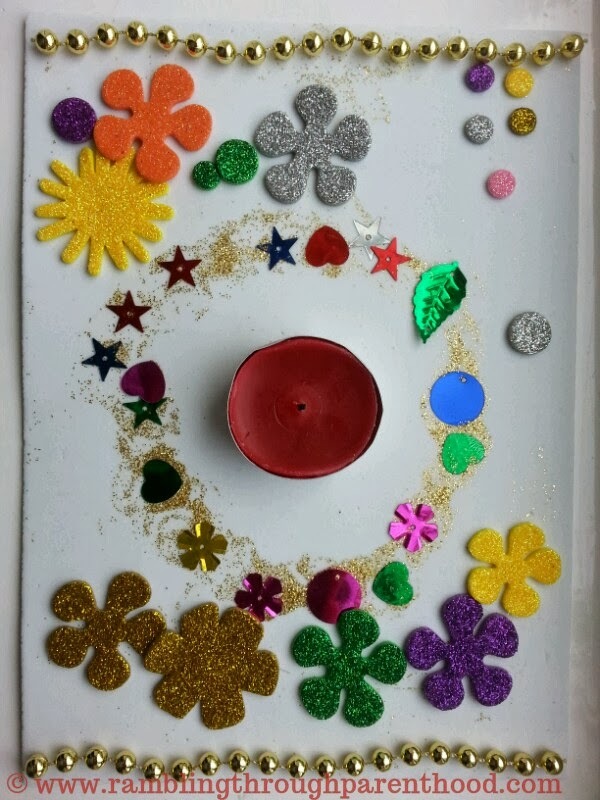 So we came up with this novel idea of making pretty shiny tealight holders. More like coasters or place mats for the little tealights. We used foam sheets for the base, as they are just that little bit heat resistant. The tealight was stuck in the centre with crafting glue. Then we went crazy with glitter glue and lots of different shiny bits and bobs - stars, hearts, flowers, leaves, sequins and beads. J also stuck some of his favourite peel-back flowers. The end-result - very pretty tealight holders. What a great idea. So simple but they look fab! 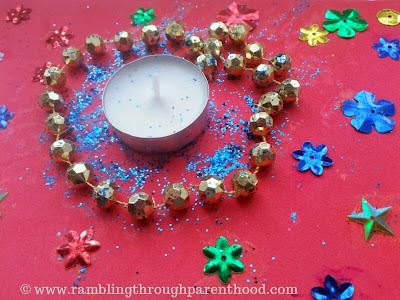 It's lovely how you made these tealights as part of Diwali. They also look fun to make.